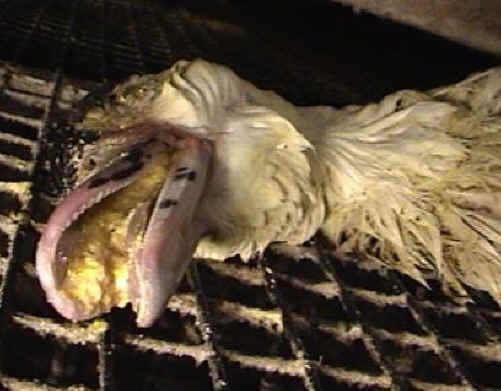 (Ducks and Geese Exploitation - Foie Gras - 16) A victim of forced-feeding, this duck choked to death on his own vomit. He now lies dead in a pen. This was not an accident. This tragedy was set in motion by the torturer-farmers in this industry who have a depraved indifference to life. If they did something like this to a human being, they would be guilty of second degree murder. In our opinion, they are still guilty of murder.